Proceedings of the Director of School Education and State Project Director, Samagra Shiksha Abhiyan, Telangana. Proc. Rc. No. 3117/SS/T6/Pdg/2018, Dated : 01.12.2018. Subject : Telangana-Samagra Shiksha Abhiyan- Review of NAS-2017 results- Remedial teaching-tracking-child wise performance through Child info website for the academic year 2018-19 -Issue of guidelines - Reg. 2) Procs of the C&DSE EO: SPD RMSA Telangana, Rc. No. 471/RMSA/ TS/2017 Dated: 14-07-2017. All the District Educational Officers and Ex-officio Project Officers of Samagra Shiksha in the State are informed that vide reference 1s; cited the National Assessment Survey (2017) was conducted for classes III, V and VIII on 13th November, 2017 in the State on par with other States in the Country. On the basis of the computerized random sampling technique, 1840 schools for class III, 1853 Schools for class V and 1575 schools for class VIII were selected for the NAS. Accordingly, the NAS was administered on 25910 children of class III, 29700 children of class V and 37585 children of Class VIII. The analysis of the NAS 2017, disclosed the fact that overall achievement of children of class III in EVS, Language and Maths was 67%, 68% and 69% respectively. In respect of Class V, the overall achievement of children in EVS, Language and Maths is 54%, 57% and 56% respectively. Like-wise, the overall achievement of children of class VIII in Language, Maths, Science and Social Studies is 53%, 37%, 38% and 40% respectively. In this regard it is informed that in the reference 2nd read above, instructions and Guidelines were issued to implement LEP/3Rs in all PS, UPS and High Schools of Government and Aided for 2017-18. The programme has been implemented for 60/90 days to improve the foundational skills of reading, writing and arithmetic and also class specific Learning Outcomes, whereas final outcomes are not so encouraging. Hence it is desirable to continue remedial teaching for the students who have not achieved minimum competencies in the Schools as the MHRD Gol New Delhi is track the child wise performance through online. Hence, it is proposed to track child wise foundational skills of reading, writing and arithmetic and also class specific skills of all children from class III to IX through online, as the Districts have completed the Pre-test and identified the Children for Remedial teaching and they have conducted remedial teaching as per their District specific plan for identified children. 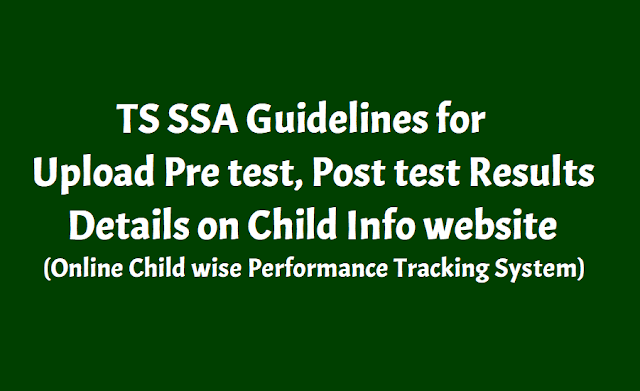 Therefore, the following are Guidelines for uploading Remedial teaching (Pretest 86 post-test) performance in to child info website as follows. Username, password and URI, address arc one and same which are used to open CCE Website. i) If the child is able to read and write Telugu/ English-Select `YES' in dropdown box, if child is unable to read and write Telugu/English -Select 'NO' in dropdown box. ii) If the child is able to perform four Mathematical operations (Additions, Subtractions, Multiplications and Divisions)-Select Yes ,if the child is unable to perform any one of the four Mathematical operations- Select 'NO' in dropdown box. iii) The child with 'YES' in all three subjects will not be taken for remedial teaching and, consequently the child name will not appear for Post-test. iv) The child with `NO' in any one of the subjects will be taken for remedial teaching and consequently the child name will appear for Post-test. In initial stage all Head Masters of High Schools and Principals of Welfare Schools and Residential are requested to enter the pre¬test results in the website. All MEOs are requested to collect pretest results of Primary and Upper Primary Schools with the help of CRPs and enter results in to website with help of Mandal MIS. In due course of time, entry will be given for performance of children for Post test. Therefore, all the District Educational Officers and Ex-officio Project Officers of Samagra Shiksha in the State are requested to issue nc. :cesary instructions to MEOs and Head Maters of all Govt and Aided Primary Upper primary and High Schools to upload Pretest and Post-test results in to Child info website.